Your tastes tend to change as you age. This applies to just about everything in life, including cars. By the time your senior years roll around, the small, speedy models you eyed in your youth are replaced by more practical and reliable vehicles. Crossover SUVs fit the bill when you’re looking for useful features and a smooth ride. Built using a car platform and a body with SUV characteristics, these four-door hatchback models have everything you need to drive in comfort and style in the autumn of life. Crossover SUVs may look sporty, but inside they offer a wealth of features perfect for older drivers. Although you may not always be prepared to admit it, any little bit of help with visibility is appreciated while on the road. You’ll find safety options, including backup cameras, blind spot monitoring, collision warning systems and parking assistance, in many crossover models. Adaptive headlights make night driving easier and safer. Many crossovers also feature ergonomic seat designs so that you’re not sore or stiff after a long day out with the grandkids. These four crossover SUV models have these features and much more to make every outing safe and enjoyable. Compare options to decide which vehicle meets your needs, and get ready for a better driving experience. The Nissan Murano was rated number one in crossover SUVs by U.S. News and was the 2017 Top Safety Pick of the Insurance Institute for Highway Safety. Together, these designations make this vehicle a winning choice for the older driver. The plush interior wraps you in comfort from the moment you slide into the driver’s seat, and an extensive list of safety features ensures you’re protected whenever you’re out on the road. With a 260-horsepower V6 engine and available all-wheel drive, the Murano has a decent amount of power for a crossover. You’ll get about 21 miles to the gallon driving around the neighborhood and 28 if you spend a lot of time on the highway. While you’re driving, you get to enjoy the six-speaker audio system with satellite radio and a Bluetooth connection, giving you an extensive choice of music to use as a soundtrack for your day. The NissanConnect Infotainment system has a generous 7-inch display and everything you’d expect from today’s in-car infotainment. If you’re comfortable with modern technology in your car and are looking for a safe vehicle in which to transport the grandkids, the Nissan Murano could be just right for you. A 2.5-liter four-cylinder engine with six-speed automatic transmission powers the Toyota RAV-4. Four trims are available with varying levels of fuel efficiency. Standard trim gets you 23 mpg in the city and 30 on the highway, making it fairly economical for a crossover model. Inside, you’ll find a fully equipped infotainment system with Entune audio, an app suite and access to popular streaming media services. Six speakers and USB connectivity with an AM/FM radio and CD player round out the entertainment possibilities. This suite is perfect for keeping the grandkids occupied on long trips, but the options may be a little overwhelming if you’re not familiar with the setup. Comfort and safety combine to make the RAV-4 a smart choice for older motorists. Pedestrian detection, a backup camera, rear cross-traffic monitoring and an available 360-degree bird’s eye view camera with a curb view give you full visibility all around the vehicle. By minimizing the chances of accidental collisions, these features allow you to travel anywhere you wish with the confidence of knowing you and your passengers are protected. When you want a lot of cargo space and enough room to transport kids, grandkids, nieces and nephews without crowding, try the Honda CR-V. Its comfort level is one of the best in the crossover market and is enhanced by the included climate control feature. The standard 2.4-liter engine has four cylinders, and a turbocharged engine is available to deliver up to 190 horsepower. However, the turbo boost doesn’t offer quite as much power as you might expect, making the CR-V lag behind some other crossover SUVs. When it comes to safety, you’d be hard-pressed to do better. Take a look at the higher trims to get a forward collision warning system, collision mitigation, automatic emergency braking, lane keep assist, and a driver attention monitor system to alert you if you become tired. All trims come with a rearview camera for help seeing behind the vehicle at all times. At 25 to 28 mpg for city driving and 31 to 34 on the highway, the CR-V offers decent fuel efficiency for a vehicle of its size. You’ll also get a 5-inch dash display to access Android Auto or Apple CarPlay, hook up a mobile device via USB or use the Bluetooth connection. This well-equipped crossover offers intuitive operation and a comfortable environment for all. 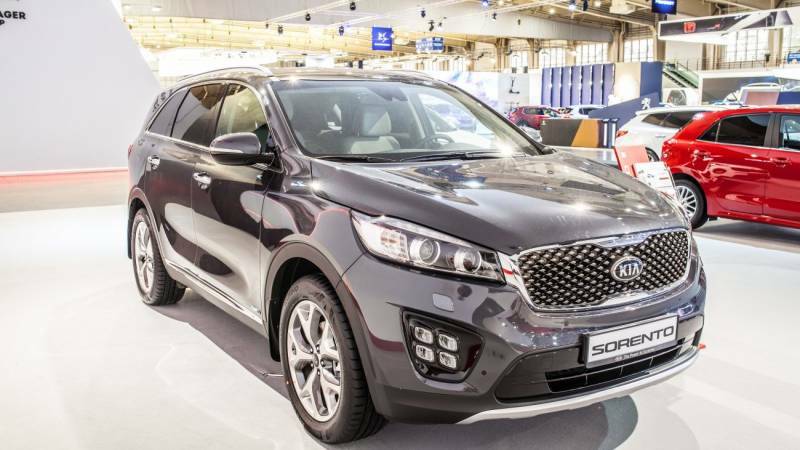 Although it doesn’t quite stack up to other models in terms of gas mileage or interior comfort, the Kia Sorento is still a viable option if you’re looking for a senior-friendly vehicle. Fuel economy ranges from 17 to 21 mpg for city driving and 23 to 28 mpg on the highway, and the standard 2.4-liter four-cylinder engine delivers around 185 horsepower. Optional third-row seating expands the interior to allow a few extra passengers to squeeze into the back when you’re ready for a road trip. These combine to create a reliable suite of tools to keep you safe as you drive by expanding visibility and providing advanced warning of potential dangers. The spacious interior includes the option for dual-zone automatic climate control, and Kia’s UVO infotainment setup offers satellite radio, USB and Bluetooth connectivity. The option for an 8-inch touchscreen and 10-speaker Infinity sound system rounds out the Sorento with enough technology to keep even the fussiest young passenger entertained for hours. A crossover SUV may not remind you of your first car, but it could be the best car you ever drive if you get one with the right features. Take your time when comparing models. Lists of standard features and optional additions can be long, and it may take a few trips to local dealerships before you find just the right combination. Do a test drive of each of your top choices, paying attention to performance and handling. Note the comfort level of the interior and the ease with which you can operate the controls. Pay attention to anything “off,” and consider these potential drawbacks when making your final decision. The crossover SUV you choose should meet your needs, provide extensive safety features and be reliable enough to enjoy for many years to come.